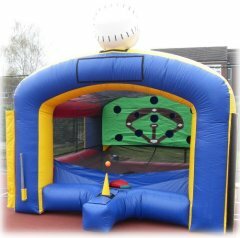 The London Olympics may be just a memory now but here at Lichfield Inflatables we have plenty of entertainments, amusements, and games for hire that would be perfect for your own Olympic style event and while not all may be Olympic sports they all provide great sporting fun for the participants. 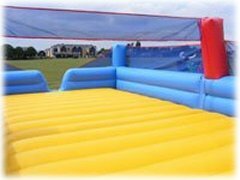 First up for the team games is our inflatable Beach Volleyball Court which is suitable for two teams of 2 - 5 players and measures 52x25ft. Generally recommended for age 10 years upwards. 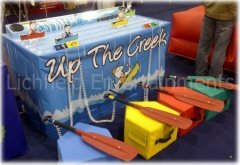 Our 'Up the Creek' electronic Canoe Race is an interactive rowing game for two to four players. When the whistle goes paddle as fast as you can. The faster you paddle the faster your boat will move along the racecourse. The first to the line is the winner. Our mobile Archery sessions can be played in individual or team formats and are suitable for participants age 8 years upwards. Another of our team games is the Human Table Football. This is played on a 5-a-side basis. Our two player Gladiator Jousting Inflatable takes you back to ancient Olympic games - or the 1990's TV program! 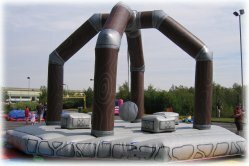 Our Wrecking Ball inflatable is another ancient themed 'knock'em off' type game which can be played in team or individual player format. This game requires a minimum operating area of 32x32ft. While Baseball and Softball may of been dropped from the Olympics our Baseball Strike game is great fun for children and adults alike and will prove very addictive to participants. 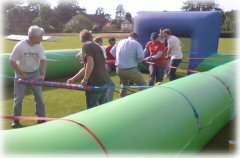 We have a range of inflatable Obstacle Courses that are great for races either between individuals or tag races as teams. 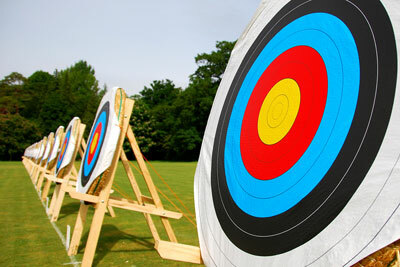 The above are just a few ideas for your Olympic themed event. Other games that may suit include Giant Darts, Mini Crossbow Target Shoots, Football Speed Cage and Penalty Shootouts, Space Hopper Football, Surfing and Snowboarding Simulator, Cork Gun Shooting Range, the Light Chaser Reaction Game, Bungee Games, Crazy Golf, Disc Golf, and more. Just browse our website to see what we can supply.